These 5 important inventions could revolutionize the 21st century. Graphene is a single layer of carbon atoms. When layers of graphene are stacked together they form graphite which is the mineral we commonly refer to as lead in our pencils. It was believed that a single layer of graphene was too unstable to isolate as a material. In 2003, scientists Andre Geim and Kostya Novoselov of the University of Manchester were able to isolate and stabilize graphene. This allowed graphene to be studied and amazing properties associated with the material were subsequently discovered. Graphene is the thinnest material in the world. It is one atom thick (one million times thinner than a human hair) and looks like chicken wire. Graphene is transparent but so dense that the smallest atoms cannot pass through it. It conducts electricity better than copper and conducts heat better than any material known to man; it's 300 times harder than steel and can stretch 1/5th of its length. This means that graphene integrated circuits and materials will completely revolutionize technology allowing our devices to do things we never could have imagined. Medicinal drugs are limited in their ability to effectively treat illness because most of them are broken down before they reach what they're intended to administer. Drugs also have side effects because they affect areas not intended for treatment. To solve this problem scientists are experimenting with the use of nanobots. Nanobots are robots constructed at the atomic level. "Nano" means one billionth. A nanometer is one billionth of a meter or three to five atoms wide. A typical virus is about 100 nanometers. Nanobots can be engineered and programmed to carry specific medications or other materials directly to infected or diseased cells and to kill those cells by injecting their payload of drugs. This new technology is included in our 5 important inventions because of it's potential to completely change how we treat infections and disease. In today’s modern era, files and data play a significant role in our lives, in our organizations, agencies, and businesses. Because of the limited storage space on our computers and mobile devices, an external service was needed that could seamlessly store and retrieve our information. This external service is cloud storage which stores data on an external network of computers accessible through the internet. All the data stored in this cloud can be accessed at anytime from anywhere. Computer scientist Joseph Carl Robnett Licklider, is often credited with foreseeing many interactive computer applications including the use of cloud storage. The use of cloud storage services will revolutionize the capabilities of our mobile devices allowing them to perform virtually any task we can imagine for any electronic device or instrument, which is why it's added to our list of 5 important inventions. The process of making a working prototype has always been expensive, complicated and time consuming. Making a prototype usually requires casting molds that would be injected with plastic, metal or other composite materials to obtain the basic structure of the product. Multiple molds of various parts would also be required and these various components would then be fitted together and assembled to hopefully achieve a working product. Often the initial molds require modifications to get the prototype working correctly. Inventor, Charles Hull, understood this problem and designed a better way to create prototypes from various materials. He invented 3D Printers. 3D printers are machines that build 3-dimensional models directly from computer-generated images. Using a process known as additive manufacturing, the 3D printer uses whatever materials you supply (plastic or metal powders) to replicate layer-by-layer the 3D computer image of your invention. The process is so precise that the prototype actually looks and functions exactly as designed. Not only will 3d printers revolutionize prototyping but they will change how a lot of products will be made and how they will be distributed. In the not to distant future, if you see a bicycle, a pair of shoes, dishware or anything else you would like to have, you could simply download a purchased design from the internet and create the product in your home using your own desktop 3D printer. 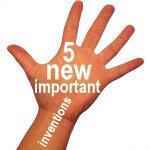 This capability makes 3D printers into product replicators, which is why we have included this invention in our 5 important inventions. for the future. Because of our growing global population there is an increasing demand for electricity. It's estimated that fossil fuels (coal, oil, petroleum and natural gas) account for eighty-seven percent of our energy resources. The problem is that these resources are non-renewable and deplete faster than we can replace them. Within a few decades we will be unable to sustain our consumption of electricity. Shortages, blackouts and restricted use will be a regular and common occurrence unless viable alternative sources of energy are created. In the coastal waters off Scotland floats a snake-like apparatus that generates electricity using ocean energy. It's the first commercial scale ocean energy system that generates electricity from the motion of waves. The Pelamis Wave Energy Converter is made of five sectional cylinders joined by hinges. Waves undulate the sections causing hydraulic rams attached to the hinges to drive electric generators inside the cylinders. The resulting electricity is then transmitted to shore using sub-sea cables. Ocean waves are created by wind blowing across the surface. Waves can travel great distances and at great speeds with minimal energy loss. Since waves are generated over large areas it is a consistent and renewable energy resource since oceans are rarely waveless. Pelamis was invented in 1998 by Dr. Richard Yemm while he was studying for his PhD in mechanical engineering at the University of Edinburgh. Man jumps from helicopter without a parachute and sets WORLD RECORD gliding to the ground in his wingsuit. Five INVENTIONS that will change the 21st Century. 2 AUSTRALIAN INVENTIONS most of us have in our home. 3 BRITISH INVENTIONS that forever changed the world. 4 FAMOUS INVENTIONS that were invented by Canadians. 5 AMERICAN INVENTIONS you may be wearing this week.